The scenery that surrounds the Berowra and Berowra Heights suburbs in Hornsby Shire, NSW, Australia consists of lush green forest of Angophora costata or as commonly known as smooth-barked apple, rose gum, rose apple and Sydney red gum. Sunset is a beautiful time of day around Berowra Heights as the last remaining rays brighten the scenery just before the clouds roll in and project a different outlook for what the evening has in store. This shot was made from a lookout along the Currawong Fire Trail. This image belongs to the travel and nature stock photo library. This stock photo of Sunset at Currawong Lookout is available for licensing for commercial and editorial uses including websites, blogs, books, magazines, brochures and advertising. Restrictions may apply for images which contain third party copyrighted material or sensitive subjects. Photos of artwork are for editorial use only. 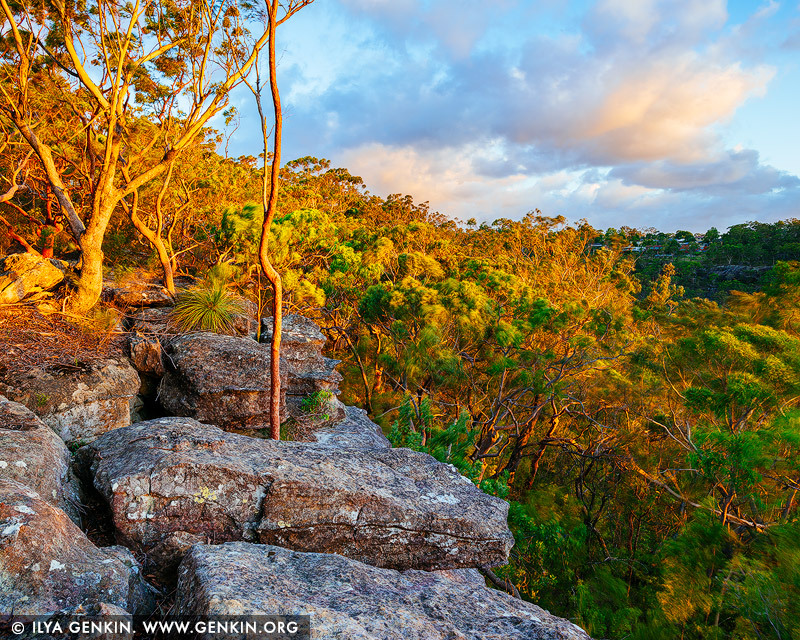 This image id AU-BEROWRA-CURRAWONG-LOOKOUT-0002 of Sunset at Currawong Lookout, is copyrighted © by Ilya Genkin. This is not a public domain image.